IBM Tivoli Service Request Manager V7.1 provides a unified and integrated approach for handling all aspects of service requests to enable a one-touch IT service experience, backed up by an optimized delivery and support process. It is a powerful solution that closely aligns business and IT operations, which improves IT service support and delivery performance. 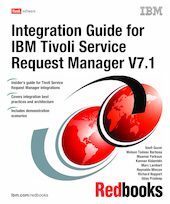 This book helps you design and create a solution to integrate IBM Tivoli Service Request Manager V7.1 with other products to provide an ITIL-based integrated solution for your client's environment. The target audience for this book includes individuals who are looking for an integrated Service Desk solution.